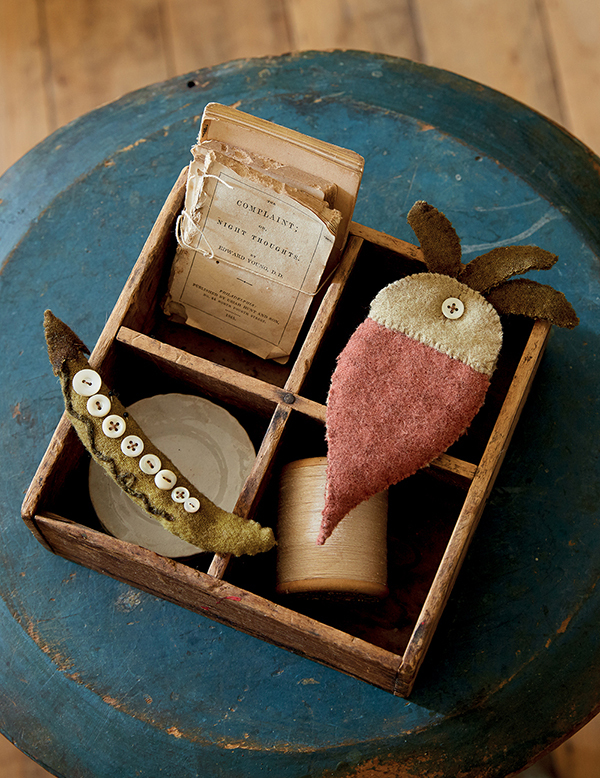 Welcome to the warm, woolly world of Maggie Bonanomi, where whimsical wonders await! 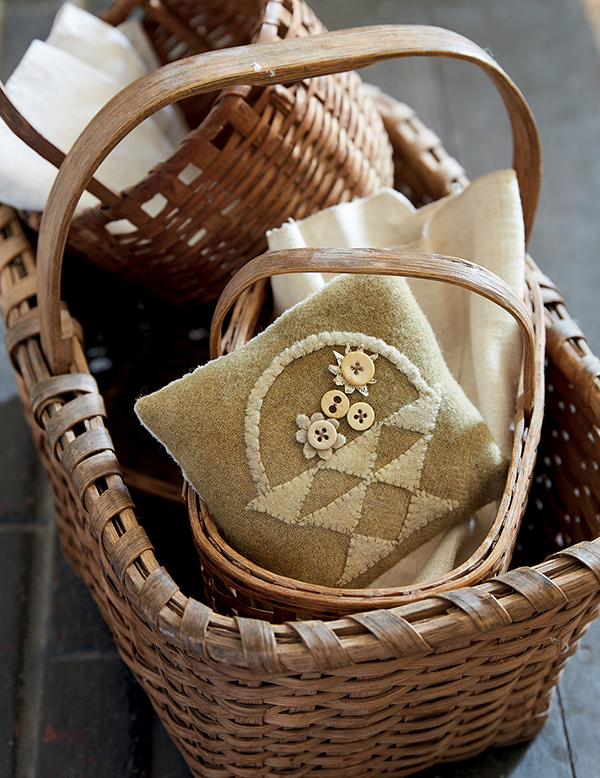 Come on in, take a seat, and enjoy some slow stitching with this celebrated maker—she’ll lead you on a creative journey inspired by a simpler time. 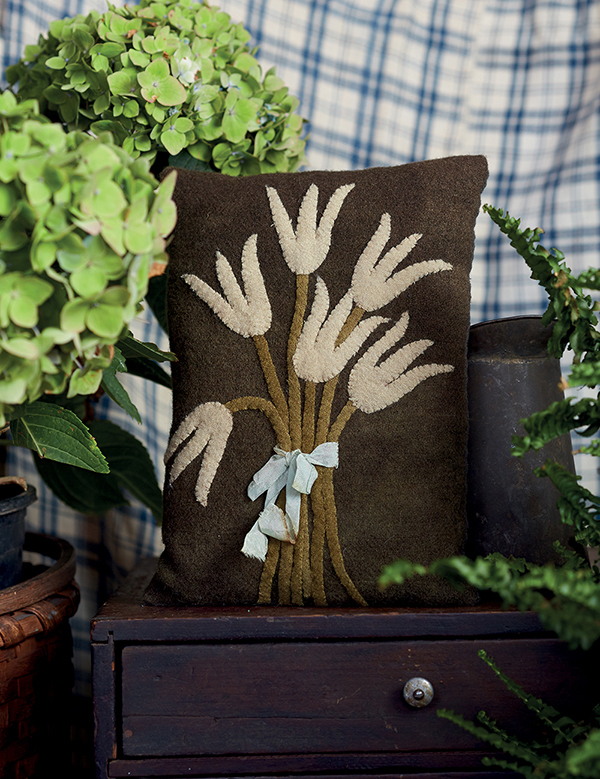 In Maggie’s world, hand-drawn patterns and hand-dyed wool combine with artful motifs and casual stitches. 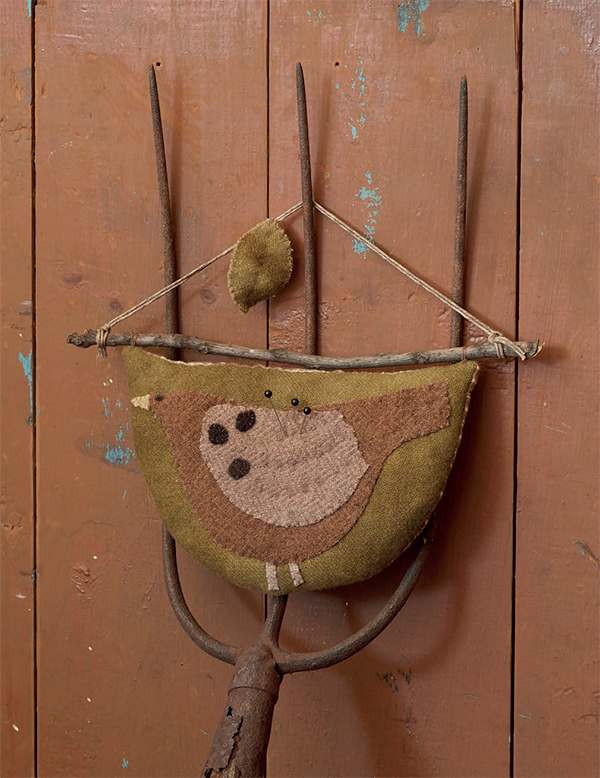 The result is Pure & Simple, a rustic collection of primitive projects that are a delight to make, use, and enjoy. No fancy skills to learn, no expensive tools to buy: needle, thread, and wool are about all you need to begin. 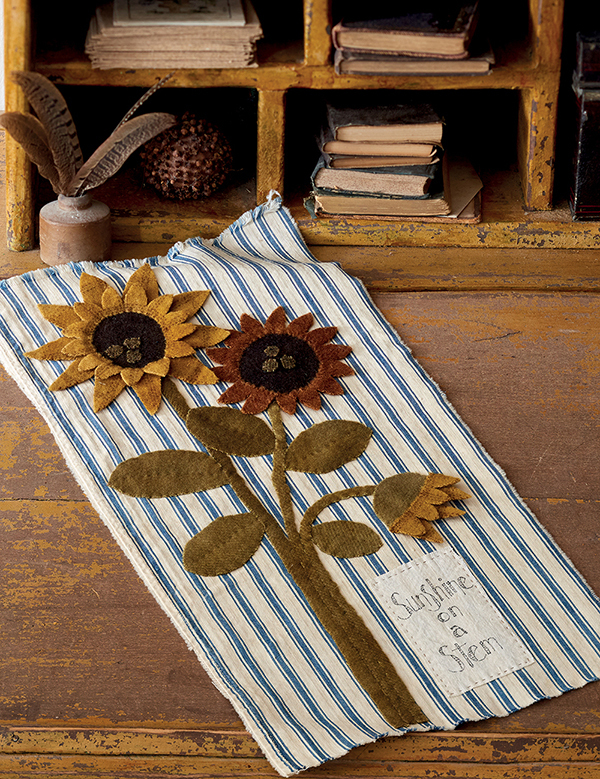 Create pillows, runners and toppers, wall art, and even clever vegetables crafted into sewing essentials—make them in minutes to warm up any nook or cranny. 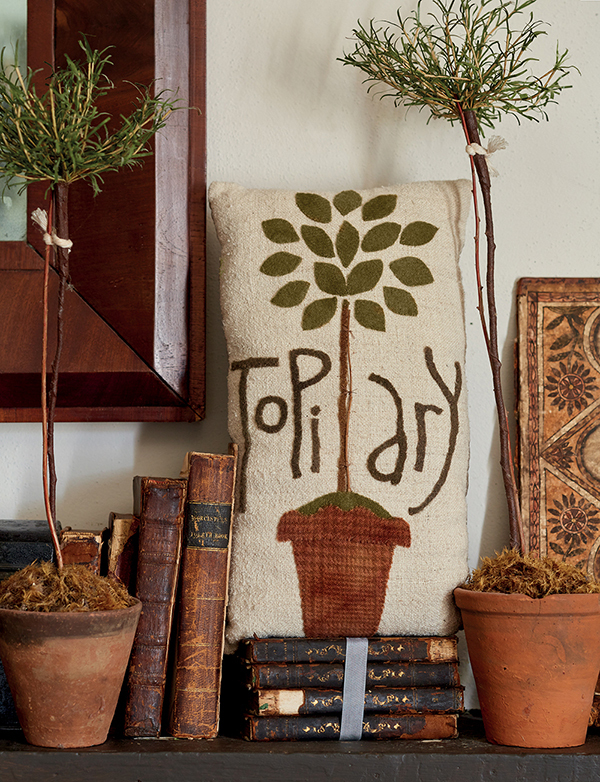 Her small appliquéd projects feature an indulgent mix of cozy wools, textured linens, and crisp cottons. When stitching her primitive designs, Maggie uses only ONE type and color of thread: Coats and Clark’s Summer Brown (how simple is that?). Maggie uses a whipstitch to appliqué raw-edge shapes. That’s it! No turning under edges. Although she might toss in a sprinkle of embroidery stitches from time to time. Sometimes Maggie uses found items, like twigs and bits of book pages, in her projects. The results are enchanting. May Basket pin keep—note how the paper behind the top button transforms it into a flower! You’ll instantly be put as ease once you learn Maggie’s stitching philosophy: perfection isn’t the goal. It’s supposed to be fun, after all! Maggie’s simple, casual style will charm you—as all things do when they’re handmade and from the heart. We asked Maggie to answer a few questions about her creative life—read her answers below. 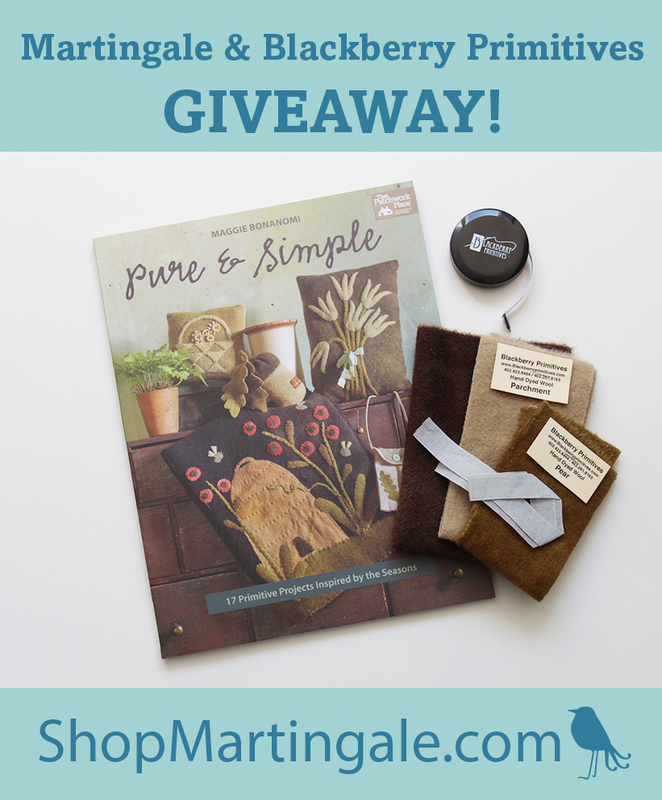 And don’t miss the opportunity to enter to win a copy of Pure & Simple AND one of three adorable kits from Blackberry Primitives! Stitch This! : How did you come to write Pure & Simple? Maggie: The way Pure & Simple came to be written is a bit of a roundabout. I started to miss writing a book; it had been a few years since my last one. I put together a monthly newsletter, which included a few wool projects that became a monthly girls’ club through the Country Sampler shop in Spring Green, Wisconsin. Once I had contact with Martingale, those projects became part of an idea for a new book. I guess you’d say the rest is history. ST! : Your work is known for being primitive, unfussy, and, well . . . pure and simple! Can you tell us more about your aesthetic? How did it develop? Maggie: I just find that working with a muted color palette and simple designs is more pleasing to my eye. I design things I’d want to live with. ST! : What’s your typical process for designing, and where do you find inspiration? Maggie: I can’t say I have a typical process for designing. I may do some simple drawings, I may be inspired by a purchase of some wonderful wool, or there may be an idea for something I want. Inspiration comes from many places. Most often it’s nature and color, and occasionally a scrap on the floor that I see in a different light! ST! : It’s obvious that you love wool and hand sewing; what is it that draws you to them over other fabrics and techniques? Maggie: Wool, particularly hand-dyed wool, is wonderful to work with. It’s easy. You can cut out a piece and just stitch it down! ST! : What do you love about being a designer? Maggie: What I love about being a designer is that I’m able to share what I love, simple as that. Well, and getting to travel to places to teach! ST! : Tell us about The Purple Turnip! 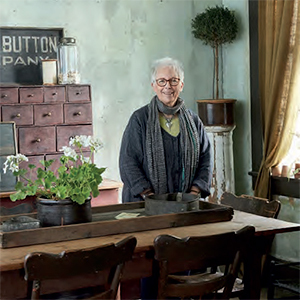 Maggie: The Purple Turnip is my studio and shop in Lexington. It’s in a wonderful building on Main Street, built in 1869. It’s only about four blocks from home. It’s a bit antiques/collectibles, old textiles (if I can part with them), ironstone, wool, my books, and an assortment of things I love. The shop is where I can work and also occasionally hold workshops. One reason working with wool is so satisfying is: there are such great colors and textures, and you don’t have to turn under the raw edges! If I had a three-word sewing mantra, it would be: stitch, stitch, stitch. It can be very meditative. My best tip for new stitchers is: NOT to worry about perfection. A lot of time, and sometimes money, is spent on our projects. The process should be enjoyed, and we don’t need to waste time worrying about how we’re doing. Before I begin designing a new project, I must have: the materials I think I might want to use as well as a simple drawing to help direct me. If I had a sewing superpower, it would be: being able to get to and make all the ideas I have! Many thanks to Maggie for answering our pressing questions—and now for more about that warm-and-woolly giveaway! Our friends at Blackberry Primitives generously sent us THREE of the cutest little kits we’ve ever seen! They come with all the wool and ribbon you need to make this pretty White Tulips pillow from Pure & Simple, plus a fun little tape measure too! How often do you set time aside for a little slow sewing? As often as I can squeeze it in. Most of my time is spent speed sewing on the machine—but Maggie’s got me thinking about slowing things down here and there! Share your answer in the comments! We’ll choose three random winners one week from today and let you know by email if you win. Good luck! 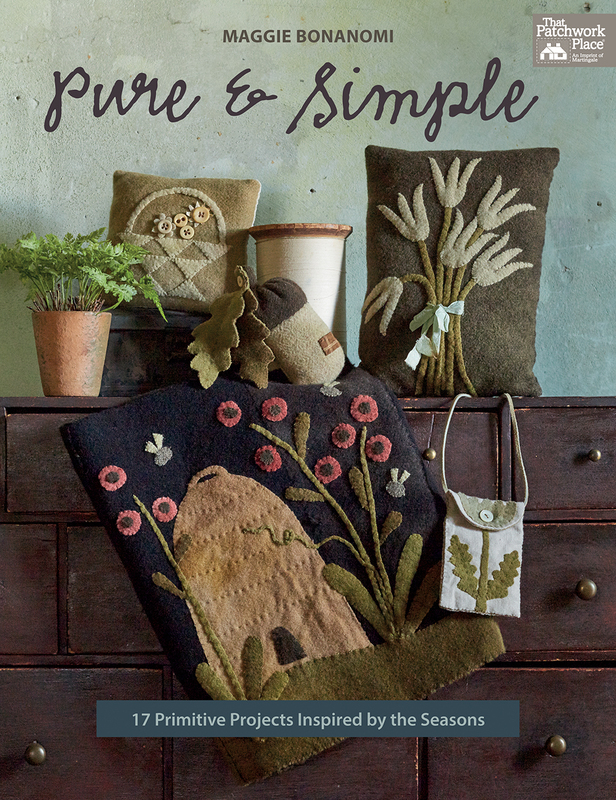 And if you feel like you can’t own Maggie’s slow-sewing book fast enough, order Pure & Simple at our website and instantly download the eBook for free. We’ll email you about your prizes, ladies—congratulations! as often as I can! As often as I can squeeze it in! It is like therapy, lol! I do most of my sewing on the machine; however, I do have "slow sewing" somewhere in my spare time! Not nearly as often as I would like to stitch slow. I enjoy it every time I do it. The projects look like fun. I sew every day. 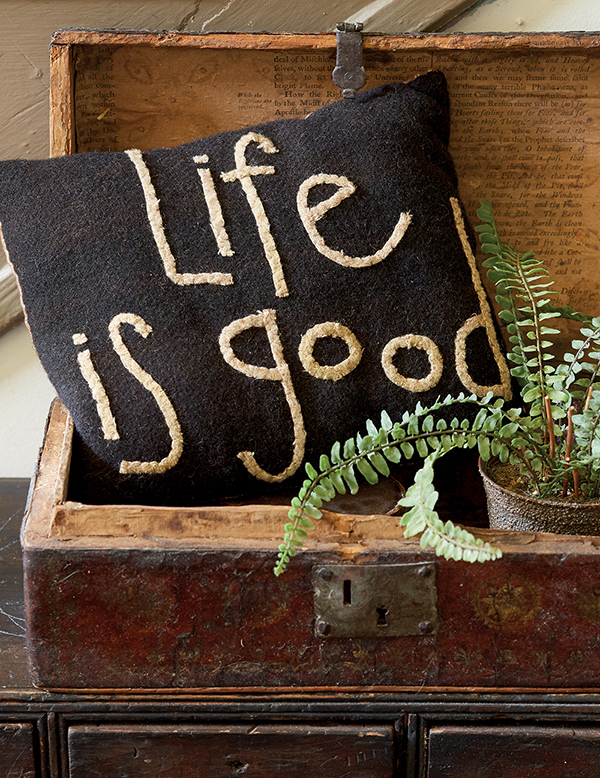 Happiness consists of a needle and thread and a pretty project. Every day, of course !! Every day–it is so calming after a busy day. Spend alot time speed sewing. I love hand stitching need to get back to it. I sew whenever I can find the time. All the quilts I have made have been hand pieced and hand quilted, just like my Grandma used to do! I find it much more relaxing than machine sewing. As often as I can! It’s sort of like meditation. Every day! What a lovely book! I stitch by hand as often as I can squeeze it in! Love every minute devoted to wool appliqué. Most of my time is spent at the sewing machine but I would love to try my hand on Maggie’s little treasures & read her Pure & Simple book. D. Most of my time is spent speed sewing on the machine—but Maggie’s got me thinking about slowing things down here and there! I want to learn to work with wool but just haven’t taken the plunge. I squeeze in slow hand sewing as often as I can at home-it’s so relaxing! I also have several small carry along projects for when I travel or wait in doctor offices. That is the only time I work on them so they are really slow projects! I don’t stitch as often as I would like. I think I need to get off the electronics in the evenings and back to stitching! As often as I can. I keep some handwork ready to go to take when I’m traveling or going for an appointment where I’ll probably have to wait. As often as I can squeeze it in! The word "Peace" would be great for Maggie’s book title too – for me, the last few years have had some hospital visits either for my mom or for my 17 year old (also named Maggie!) – I have a bag of wool applique things that are easy to take with me and doing wool applique helps me to pass the time away in a peaceful manner. Often other folks, nurses or patients will ask me what I am working on and it’s a great conversation starter that does not focus on illness! I do hand sewing every evening – even if only for 1 hour. I consider hand sewing, slow sewing. So relaxing and meditative. I slow sew as often as I can squeeze it in. It’s my preferable way to sew. In the winter when life slows down, I try to sew a little every day and always with wool. Thank you Maggie, Blackberry Primitives, and Martingale for this delightful giveaway! Every Night! I wish! But as often as I can and always a slow stitch,I find it so gratifying so see it come to life. What a great interview with Maggie! Thank you very much for the lovely giveaway! Several times a week. Wish I could every day! At least once a week! I love a grab and go project! My current piece is for Christmas so I’m stitching as often as I can right now. I love your simple designs. I slow sew whenever I watch TV at night. Slow but sure progress. Love it! I sew everyday! I do wool hand projects every night. Daytime sewing is either machine or hand, depending on my mood. Every day! Sometime all day! I try to make time as often as I can to do some slow stitching. Its so relaxing. Every night when watching TV. New ideas always welcome. I’d say at least once a week. More often if I have a wonderful project like these in the book. Thanks for the giveaway. Lately, I have been doing handwork almost every day. I love Maggie’s books! I stitch every day and was introduced to primitives and stitching with wool last fall – I’m in love! This book and these delightful projects will absolutely be on my "must do" list! Not often enough! Agree with all that it’s time to cut back on machine sewing and enjoy the slow lane. I love hand sewing, especially with wool. While I use my domestic machine to finish larger quilts, I always find comfort and calm in a hand project. My once a month small group gathering with fellow hand sewers keeps me inspired! i do my slow stitching in the evenings while watching tv and catching up with my family. I try to stitch a couple evenings a week and every Tuesday with 2 friends. Thanks for the opportunity to win this fantastic giveaway!!! At least once a week. Hoping to increase that time. I do some “slow sewing” at least once a week — typically several times a week. Maggie’s designs are enchanting, and I agree with her about how relaxing it is to work with wool. Honestly, I’m pretty sure that if we all took a couple hours every week to stitch quietly and just breath … it would solve a LOT of the world’s troubles on both a personal and community level. Thank you for these interviews and book highlights. I can’t purchase all of them — more’s the pity — but I read and enjoy every one. You know I was all about the speed but recently I hand quilted for the first time and loved it! Been embroidering more and just loving the pace! I leave hand sewing in a badket next to my chair in the living room. I pick it up when we watch tv. I try for at least 15 minutes a day, more if I have the time, it’s my "me" time. As often as I can squeeze it in as I find it relaxing and fun. As often as I can. It’s great on road trips! I don’t do slow stitching as often as I would like. I should do more because it is my favorite thing to do!! Almost every evening. It is a great time to have something to do with my hands while watching TV. I mostly machine sew but would love to try wool hand stitching. I slow sew in a class of great quilt makers every Monday morning. A great way to get the week started. Maggie got me thinking. I do need to slow down and do some hand sewing. I stitch as often as I can. I like to have a stitching project to do while I’m watching TV. It makes me feel more productive! Watching Netflix or Amazon Prime or movies from the library in the evenings after dinner I almost always have a stitching project in my hands. It’s amazing how much can be done in those otherwise idle hours. I think this little book is delightful and so aptly named and would really love to have a copy. Thanks, Maggie, for putting it all together and to Martingale for bringing her to all of us. As often as I can. It is so relaxing! As often as I can. I will have something to do while watching (listening) TV. Even after hand surgery (left hand) I was doing YoYo’s! Have to keep the hands busy. I try to spend a little time each day doing something slow and easy — it might be some stitching, maybe some reading, maybe a simple cup of coffee listening to the birds chirping. This book appeals to me. Hand stitching is my relaxation. If I’m sitting down in front of the tv it is usually with a hand project. In my spare time, I use the machine more. Great giveaway! I enjoy slow sewing while riding in the car. My answer is as often as I can squeeze it in. This book just flew to the top of my must have list! As often as I can which usually works out to daily. Even if it’s 10 minutes just choosing fabrics for something. I speed sew and LOVE handwork with wool especially. Can’t wait to get my Maggie book!!! Every day and as long each time that I can. As often as I can. Slow sewing is part of my weight loss program. Busy hands, no cookies! So answer? As often as possible. Once a week . It really helps to relax me. Time to start on Christmas gifts. And these projects are very portable. I like that in the summer. My husband likes me to have something to do in the car so I don’t watch him drive. Sounds like a plan. As often as I can squeeze in! I do a little hand sewing everyday, whether it’s applique, EPP, a binding or a little cross stitch. I have something going at all times. Slow stitching is done while watching TV. Working on round robin cloth book currently with different themes for each person, fun! As often as I can… usually cross stitch and applique for labels, definitely I prefer to hand sew bindings, and I’ve even got a big stitch table runner in progress. We need the slow down for our heart’s sake! Too much go go go wears us down physically and mentally. I know, lots of stress at work right now (this, too, shall pass) and sitting quietly stitching in the evenings helps me slow down and shut off the inner noise! Most of my time is spent sewing on a machine, but I really like her designs. I used to love to cross stitch and am interested in the "big stitch" movement. I try to get in some hand sewing every day, and I love wool applique. Maggie’s designs are a delight and a great inspiration! As often as I can even if it is only for 10 minutes. Ditto with Janie – car trips, long meetings, whenever I sit for a few minutes. Love Maggie’s designs. I sew a little every day. It’s my reward for getting my chores done and keeps me sane! At least once a week. It’s so relaxing. Every day! I consider it my "therapy time"! Hand stitching with wool is so relaxing. I like doing it as frequently as I can. a special gift to treasure for years to come. Not only is it relaxing but it makes the heart feel so good when it is appreciated so much by others! I mostly do speed sewing. But I need to start doing more slow sewing to relax and enjoy. Every day! And at least one hour every day! As often as I can – generally when watching TV in the evening or while traveling. Most of my time is spent speed sewing by machine but Maggie has me thinking about trying some relaxing hand sewing this summer while I have some extra time. I do handwork (mostly applique) every day. And, I love the description “slow sewing” because it conveys relaxation and comfort. I try to do some slow sewing every evening–I find it very relaxing. I love Maggie’s faded color palette and perfectly imperfect designs! Every spare moment at the lake I spend slow sewing, best way to relax. I sew everyday. I machine sew during the day and hand sew (applique) while watching my favorite tv shows in the evening. I also take my hand sewing with me everywhere I go. I am a speed sewer. Haven’t even made yo-yo’s or cross-stitched in ages. Whenever possible, but especially when I need to de-stress, to slow down and enjoy the feeling rhythm of needle going through fabric. In the evenings in the winter I like to do some slow stitching. I try to spend some time each day working on projects. Hand sewing is more relaxing and I usually do it while watching TV (actually more listening than watching) in the evening. Machine sewing gets fit in whenever possible. Thanks for the great give away and chance to win. Most every day! I always have a slow sewing project to do in the evenings – many of my days are spent speed sewing so that I have something prepared to do at night! I stitch as often as I can, even if it’s only a few minutes. It’s my refocus, down time. Any time I’m in need of a little stress reduction! Usually in a hurry. I need sometime to slow down. I do at least a little wool applique or embroidery every day! I usually have 3-4 pieces ready to work on at one time. I carry a small project in my purse to work on during wait times, have a project near my recliner for TV watching, and even one at my computer for while I’m watching streaming videos. I have 5 BOMs in progress this year that I am keeping current. I would love to have Maggie’s book and kit! OMG, these are just lovely. I used to do lots of handwork, now I mostly piece quilts by machine. These projects make me seriously think about doing handwork again. I DO love doing hand stitching! Every night at least!! Sometimes (actually often) during the day too! I love love love wool appliqué! So easy and very rich in texture. I am currently working on a Jo Morton appliqué project using her back basting method with cotton and needle turn. Just can’t get enough!!! I enjoy slow stitching in the evenings while my husband and I watch TV…..also when I travel, I also take a project or two with me to work on too. Very satisfying! Hand sewing is my thing and I try to work on something everyday or squeeze it in anytime I can. I love Maggie’s newest book! I’d love to be able to find time for stitching every day, but alas, it has to be whenever I can fit it in. I do try to stitch every single day, but it isn’t always possible. Hand stitching when I get home at night from work and try to get a some stitches in and in the weekend at night while watching tv. I love to sew and embroidery. I just made fabric paper dolls for my two youngest granddaughters. I felt like I was in kindergarten. I have a grandmas bag that is filled with my embroidery projects. My husband always reminds me, don’t forget your bag. Our trips consist of over 300 miles as we travel once a month for medical. I love to sew on the road while still enjoying the beautiful landscapes and quality time with my husband of 49 years. I hope I win. I love these projects you shared. I love to sew and embroidery. I just made fabric paper dolls for my two youngest granddaughters. I felt like I was in kindergarten. I have a grandmas bag that is filled with my embroidery projects. I try to do 15 minutes a day. And for sure if I am watching TV! At least once a week and more often if I can fit it in. I set aside as much time as possible to sew, when I’m not baby sitting my grandchildren. I sew mostly at night. Not enough! I am SO interested in learning to work with wool & applique. I have so many tops done, but not quilted or bound….grr! "As often as I can!" I do enjoy handwork…although tendintis in my hands will slow me down. Every day! I feel deprived if I can’t do at least a little slow sewing! I try to slow sew several times a week. I have fallen in love with this type of sewing. I love stitching quietly in the morning before my household is awake! Thank you for the chance to win this beautiful book! At least once a week, more when I am working on a project. I can’t remember the last time I have taken time for some fun, simple slow sewing just for me. I used to do lots of hand sewing of various kinds. Arthritic thumbs caused me to switch to machine sewing. Now I am much better due to meds and exercises,so I am eager to start some new hand projects. Love the look of wool applique and can`t wait to jump in! I do some hand stitching every day. In the evening, I have to have something in my hands to work on. I do my machine sewing during the day. I love Maggie’s simple patterns and ideas. The simplicity helps you be able to enjoy the process! Most evenings is my time for slow sewing..I am particularly into EPP right now but love to embroider too! I hand stitch whenever I can find time. I take something with me all the time, just in case I have a free minute. I wish I could say everyday, but the reality is I squeeze it in when I can. Sometimes that’s only 15 minutes a week. But I do love to do a little slow-down meditative hand sewing whenever I can. EVERY DAY…It’s what keeps me sane. I try to do hand sewing most evenings. I sew by machine during the day and hand sew at night while watching TV with the husband. I love keeping my hands busy and have wanted to add wool applique to my tool kit! As often as I can! I am just beginning to work with wool and would love to win Maggie’s book and pillow kit. Thanks for an awesome giveaway. As often as I can fit it in. Most of my time is spent speed sewing on the machine. Hand quilting a lap quilt is my slow project at the moment. I have a wool project in my UFO pile that is up next. I pick up a project any time I have a few moments. I love the primitive look and hope to sew more of it soon! Hand work isn’t my first choice, but I have a quilt that needs wool applique and I find I enjoy doing it during tv commercials! Did hand sewing when my children were small. Then time became of the essence, and I sewed exclusively on the machine. Funny enough, to slow down, I knit and did embroidery – usually cross stitch. After seeing these beautiful little pieces of art, I think I may just have found my next favorite thing. I have to stitch at least a little everyday!! I love having a small something,in my purse just so I can stitch a little while waiting at the doctors office or whenever I can! I love to hand stitch, so the portable projects get to go to the borough meetings with me. Can’t just sit idly by, without doing something. Most days I do some hand stitching. When I have completed a project and haven’t organized a new one, i’m at a loss! I love stitching with wool! I love wool work so as often as possible! I try to every day, but not enough hours in the day to do all I want! I used to only stitch on the machine. However, I have always been entranced by woolies and wool applique. I bought a few items, but never worked on them, until my spouse was hospitalized and subsequently had a leg amputated in March. He did not return home until the end of April. I had a lot of hospital waiting time to start stitching and it has been an escape for me. As he is still very needy, I cannot sew on the machine, but try to set aside some time every day to do some handsewing. I try to hand stitch every evening in front of the TV. I am currently working on Settler’s Pride by Maggie. Most of my sewing is on the machine. I have started to go back to doing some hand embroidery. So moving on to wool is the next step. I have collected a couple of kits so I need to get them out. I’d like to say everyday but it is more like as often as I can altho I do love hand work. I keep handsewing projects close by when I wind down in the evenings. Surprisingly, I actually finish projects sewing sometimes for a few minutes each evening! As often as I can. I haven’t worked with a lot of wool, but still have the 1st wall hanging I made with felt over 50 years ago. I have started working with wool and it is exciting….I need more time for all my sewing projects….. I enjoy hand stitching – applique, embroidery, embellishing, and any other project I can do by hand. I have not tried working with wool but would like to add that to my list. Wonderful book! I love to stitch every day! These are lovely. I have been working some embroidery kits and am looking to expand on and learn something new. This looks like what I’ve been looking for. I love to hand applique and am currently starting my first wool project. I love doing it. I have been doing a little hand applique everyday for at least 10 years. It is so very satisfying. I do hand sewing at least once a week. I love it!! I hand stitch most evenings. I’m new to wool applique and find I enjoy it a lot. My supply of wool is small, so I’m still doing mostly embroidery with cottons. As often as I can and most times there is not enough time. As often as I can. Wish it was more!! Not enough! I have a couple projects in the works and many others to be done. Every time I sit down and work on handwork I ask myself what the problem is that I don’t make time to do it daily. A day without sewing is a sad day for me as I love to sew and I wake up each day looking forward to working on a project. I love Maggie’s designs. They carry a simple design message that touches my heart. I try to stitch something every day, either hand or machne. Since I have retired I often have the luxury of sewing all day. I sew on the machine in the daytime and hand sew on either quilts or wool projects in the evening. Still, with other projects or housework, it is not as often as I would like. Love her new book! I try to stitch a few times a week. Wish I had time for more. Oh, everyday! I agree with Maggie, hand sewing is very meditative and satisfying. Most of my sewing is at the machine, but hand stitching is wonderful for taking on vacation or long car rides! Not nearly as much as I’d like, but I squeeze it in when I can! I stitch whenever I get the chance, though my favorite is stitching on the deck in the shade of my trees surrounded by flowering potted plants. Most of my time is spent speed sewing. But I do enjoy slowing down a bit here and there. And I am finding I like working with wool and felt. I try to spend at least 30 minutes each day. I mostly sew by machine. Occasionly, I bind by hand. I just retired so I have time to stitch almost everyday. I love machine quilting and am enjoying taking time for hand applique with wool and cotton. Would love to stitch every day, but some days by evening I am too tired to thread a needle, much less stitch. Love these simple, charming designs. I love love love slow sewing. I usually do a bit every evening before bed. As often as I can, depends on my schedule. Most of my time is spent speed sewing on the machine—but Maggie’s got me thinking about slowing things down here and there! Really enjoying the look of wool with hand stitching. As often as I can, almost everyday!I try to keep some hand work to work on at night or on my lunch break at work. As often as I can. It used to be every day but I’m back in school working on my masters so it’s not as often as I’d like. Love the pin cushion and topiary! Looking forward to seeing the entire book up close. I slow stitch every day. Usually at night while watching tv. I slow stitch every day. I sew every day. When I was working, I Quilted infrequently. Now retired, it is my goal to at least do a little sewing every day. Find it relaxing. I like to stitch each day as it gives me time to relax. Most every night while everyone is watching tv. As often as I can squeeze it in, which is most days, even if I just quilt a few stitches. I mostly sew on the machine but lately trying some hand appliqué, would love to do more as time permits. As often as I can. I love slow stitching. Have to sew every day! Even if it’s just for a few minutes. Her book has me interested. It looks relaxing, and I love her "rule" about not worrying about perfection! I do one kind of slow stitching every single day. Whether it’s wool, punch needle, knitting, or doing some binding, I just about can’t not stitch every day. Thanks for this awesome opportunity! At least once a week, and sometimes it becomes more of an every day thing, especially during lovely spring or fall weather when I can sit outside and stitch away while enjoying the woods in which I live! I spend time slow sewing each night while “watching” tv with my husband. As often as I can but not nearly as often as I want. My main passion is my slow stitching, but my fingers aren’t as nimble as they used to be. Not often enough, probably once a week. I do a little slow sewing whenever I get a chance. I love to embroidery, have wanted to do some wool work but for some reason it intimidates me, I even have a couple small kits I haven’t touched. do hand work again soon. Sometimes, in the midst of an overload of projects, i just lean back and grab a very small project and give it my 15 minutes of luxurious time. then the world can capture me again! Pure and Simple makes me want to stitch every day! Most of my time is spent at the sewing machine. I am inspired to do some hand stitching. Everyday even if it’s just for a little while. It’s so relaxing and I love the simplicity and choice of colors. "Gram, will you watch me play (some game on the computer or X-box)?" is one of my favourite opportunities to sit and slow-sew – that and sitting on the sheltered deck on a summer day. As often as I can! I do a lot of hand stitching on my quilts, so I slow things down petty often. I try for several times a week, sometimes I can do every day, sometimes not at all–that’s my life…. I sit down with handwork every evening. I actually resent it if I have to go out and miss my quiet time. I am a quilter who does speed sewing for some time most days, but I save and savor my slow hand sewing for night time. While I visit with my hubby and watch or listen to a little television, I practice my crafts learned as I was growing up and regained a few years ago. I had forgotten the joy and satisfaction from pulling a needle with thread through fabric but it didn’t take long for me to realize that this touches my soul where few other things do.!!! I enjoy hand sewing when I can squeeze it in. I especially like the control in stitching and the mobility of hand sewing. Thanks for the chance to win! I slow stitch everyday. It feels like something is missing or off if stitching is not part of my day. A truly zen experience for me. I really dislike being held captive sitting at my machine. My stitching friends call me “Handwork Marianne.” I smile and tell them they should try it sometime. When I finish a hand stitched project they all look at it in amazement. Slowing down and enjoying the process is life-enhancing. Thank you for asking this. i’d be a speed stitcher!!! I try to spend some time each week slow sewing, particularly watching PBS series such as Little Women. Slow sewing/stitching more than several times a week…do not always get to stitch daily. I slow stitch a few times a week–I really love hand binding! I work on a bit of sewing each day either early in the morning or in the early evening. Working on something each day makes sewing projects a simple process that is totally enjoyable, and all those UFO’s do get completed! Every day but I have yet to try using wool! As often as I can make it happen, usually several days each week. As often as I can squeeze sewing time in. I have 3 projects going right now …embroidery, rughooking and a table runner (by machine). So when I’m tired or watchinga show I do slow sewing, usually week nights . It is a bit rare because I don’t have the right projects to do handwork on for now. This kit would be a great way to get started with slow stitching. As often as I can. Can’t wait to start working part time (next week) so I can have more time to do what I love! I love stitching with wool appliqué! I wish football was on all year, cuz then I would get lots of stitching done:). I squeeze it in whenever I can; so fun! I sew as often as I can squeeze it in. As often as I can fit in. As often as I can squeeze it in! I sew every day, if not at the machine I’m doing some hand sewing or quilting. I try to sew every day, if not on the machine, then by hand. Hand stitching is so relaxing, no 1/4″ seams to worry about, just getting those stitches on the redwork even. As often as I can…love to do wool work while watching TV in the evenings. Whenever I can, I try to do some handsewing. That’s my favorite- I love handquilting especially. Most nights as long as I have something prepped! Wool is my fabric of choice so I use it as often as I possibly can. I try to do slow sewing every day along with some speed sewing. My slow sewing is usually done in the afternoon or evening and I find it very relaxing. I try to do slow stitching, embroidery, every day. Once in awhile for me. Life is so busy! Most of my creative time is spent machine sewing. I love Maggie’s designs and plan to set aside more time for slow sewing. Thanks for the fantastic giveaway! As often as I can. I have three wool BOM’S going currently and one of them is Maggie’s Settlers Pride. As often as I can squeeze it in, but at least once a week. At least once a week!! thank you! As often as I can squeeze it in. Thanks for the chance to win. As often as I can! I love hand stitiching, it’s very therapeutic! My goal is at least 30 minutes per day but don’t always hit it! As often as I can squeeze it in!! Usually I am sewing speedilly on the sewing machine but I do like to sew by hand and today, I actually sat down to sew by hand. I had 2 small quilted blocks that I had no real use for, so I put binding on them and sewed the back of the binding by hand. Now they are mug rugs. TaDaa!! As often as I can find time, however would love that to be more! I don’t set aside much time for slow sewing, but have been thinking about how I want to do more of it. Really like the topiary in this book. Almost every day I either do some sewing or some crocheting. I enjoy handwork while watching a show or 5 in the evenings. Everyday,even if it’s only for an hour I find it relaxes me. Most of my time is spent speed sewing on the machine—but Maggie’s got me thinking about slowing things down here and there. I’ve made one thing with wool and liked it a lot. But supplies around my area were hard to find, until I read this post! Would love to win and try a kit! Thank you for the giveaway. I do a some stitching nearly everyday. 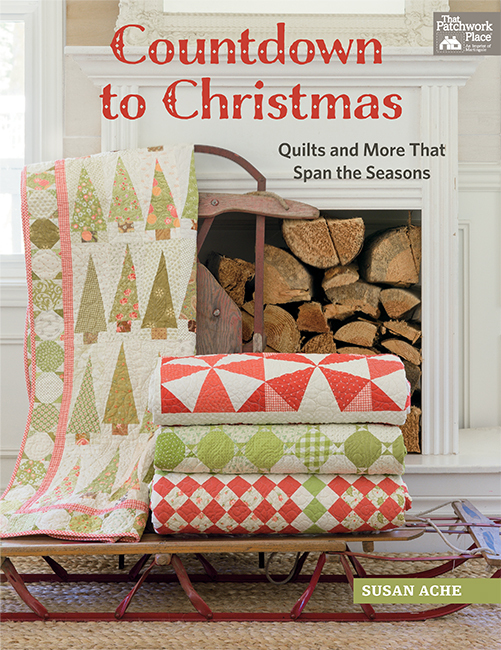 I love to hand quilt, and I must say your book looks amazing! As often as I can. I stitch during my lunchtime, I love to stitch while relaxing on the porch, I stitch while attending sports practice with my daughter. No better way to escape the rushing of a busy life. I try to stitch everyday, even if it’s just for 10 minutes. It helps me relax and slow down. Almost every evening, when it’s wind-down time from a busy day, I spend a little time slow stitching. Often it’s English paper piecing or hand embroidery. The best time of the day! I set 1 day a week to do some slow sewing, that is my only day that I can do it and it is good mental therapy. Maggie’s got me thinking about slowing things down! I would do it more often if I could settle on a pattern or kit. Don’t have wool locally, but I really want to get into some hand sewing in the evenings. I always have something to do handwork on my coffee table. I like to work on it in the evening. I also find it helps me calm down when I am stressed or worried about something. It’s a very good "medicine". I try to sew on something every day. I find it relaxing and takes away some of the stress of our everyday busy lives. I don’t squeeze much time in for sewing, but I love the simplicity of Maggie’s designs, and the texture and beauty of the hand-dyed wools from Blackberry Primitives! I hope to do more sewing in the future. Just about Everyday! My grandmother always had her “handiwork “ by her side at night to sit and sew. I am just like her ! I try to sit and hand stitch every day, as often as I can! I love handwork and I now use Maggie’s summer brown thread for nearly everything. Thanks for the chance to win! Love Maggie’s designs – they’re what got me started loving wool appliqué! As I often as I can but runs in cycles depending on life demands! At least once a week! When I can but more often in warm weather than cold. I’ve only just started working with wool and discovered that it is more forgiving on arthritic fingers. Everyday, thanks for offering this awesome giveaway! I try to sit down & have quiet time with slow sewing every day! It may be in the middle of the day when I need a break or sometimes not until evening. My favorite sewing time is outside on my deck where I can enjoy the beauty of the flowers & listen to the birds! I have several of Maggie’s books & enjoy her slow process of hand sewing & creating! As often as I can!! I usually stitch every other day. Thanks for you generosity for this amazing giveaway!! Q: How often do you set time aside for a little slow sewing? A: As often as I can squeeze it in and/or at least once a week! I do handstitching almost every evening as I watch and listen to TV or music. I have completed two of Maggie’s wool quilts as well as numerous smaller projects. One is in progress now, there are three waiting for backing. I also attended a rug hooking camp in Fredericksburg, Texas, where Maggie was an instructor. Several of us did wool appliqué under her tutalege. It was a wonderful experience and one I will always cherish. I don’t have Maggie’s newest book as yet and would love to be able to add it to my collection. Usually every day or every other day. It’s also how I unwind once I get home from work & after I’ve eaten dinner. I try to stitch every day. It just makes me feel happy and there are so many beautiful things I have waiting to be stitched. Maggie has been my favorite designer for years. I try to hand stitch every day. I keep a project going. Everyday unless life gets in the way! My happy time. I try to do some hand work every day, I don’t always make it but I try. At every opportunity I sew on wool peices. Maggie’s books are among my favorites! I’ve completed most all of the patterns in her "Buttonwood Farm" Book. Love this new book! I do hand stitching 2 or 3 times a week—hand piecing, EPP but mostly wool applique. Recently have participated in Walnut Valley monthly stitch along projects focused on Maggie’s patterns. I love hand sewing but don’t spend as much time as I’d like doing hand projects right now because of work responsibilities. I tend to stitch more when I’m on vacation and have time to slow down. I love Maggie’s simple style…it’s a good reminder to slow down and enjoy the simple things. I see whenever I can- usually every day! I stitch almost every day. I find that it is a perfect way to unwind at the end of thr day! I love the feel of wool and have found that working with wool is very addictive! Every day. I don’t always succeed but I do really try. Nothing distresses me like needle and cloth in any form.My husband loves to watch me stitch. He says I’m in my own little world and my expression is so stress free. Every day!!! It is my therapy!!!! As often as I can squeeze it in. I am really hooked on slow stitching. Thank you for the generous giveaway. At least once a week, sometimes more if the weather is bad! As often as I can squeeze it in but most evenings as the day winds down. Even though retired the days fill up & there never seems enough time for slow stitching! My Friend and I get together once sometimes twice a week to sew Maggie Projects. We have a lot of Maggie’s Projects all cut out and pinned on but not finished. We need time to not think about anything and Maggie’s Projects help us to go to another place dreaming. We love everything we know about Maggie and all her projects and ideas. The Wool colors she uses couldn’t be more beautiful. We are just finishing the long log cabin design right now. WE love it! My Friend and I are excited about going to Maggie’s get together/ open house in Lincoln, NE. We just keep on dreaming! I usually used a machine, but I love these projects! Maggie’s designs just speak to me on some level and put me in that special place when I stitch. I need to slow life down this year and start stitching again! I try to hand sew every day as I find it very relaxing and enjoy seeing progress. EVERY DAY – or I get grumpy! I try to sew at least a little every day, maybe some wool work, maybe make a binding, maybe piece a block or maybe spend a whole day long arming a finished project. Some days I sew for fifteen minutes, other days maybe five or six hours. Lately… the garden! The garden takes so much time it’s hard to sit and sew, but soon it will be self sufficient, at least for a while! And maybe I will stitch a Maggie project! I get the most hand sewing done when I get together twice per month with our applique groups. Try to stitch daily! Makes me happy and best therapy ever. Love Maggie and her style. Love her Pea Pod in Thistle Down Moon. 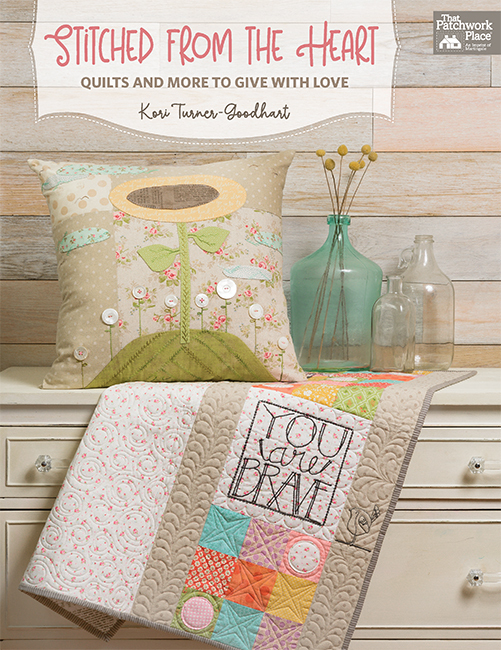 Love her new book with the Radish and other cute patterns!!! i stitch everyday, it is as much a part of my day as eating and breathing. meditation in action. maggie’s work is a wonderful way to honor the materials and the process, and keep them relaxing and fun. Several times a week. I try to gather small hand projects to work on in the evening when I’m relaxing. My job is long arm quilting, do I don’t get too much time to do slow stitching! I take every chance I get!! I’m working on settlers stride right now! My goal is to work on a project for a couple of hours every evening. There is no better way to unwind after a busy day! As often as I can, usually more than once a week. Would love to be able to do it every day – it’s therapeutic. Not as often as I would like. I do a lot of it when I am riding in the car. I need to find more time to stitch. It is such a relaxing and enjoyable thing to do. I am vowing to make more time to stitch this year. Love working on Maggie’s projects. Find the slow method very relaxing. Try to have a project going all the time and work on one at least a few evenings a week! Everyday after dinner. Love that time! I love handwork, so as often as I can squeeze it in! Slow sewing is an essential for me, each day, but with all these new beautiful, gorgeous designs from Maggie, I am going to need to speed up to keep up! As often as I can. I always have a few projects started. Love working with wool! I am mostly on the machine, but looking to add more slow stitching into my life. Whenever I can!! Love the sense of calm and the feel of wool!! I try to have a slow stitching project in process at all times. Even if I don’t have opportunity to stitch every day, I have it close by! As often as I can, there are usually 2-3 wool projects in progress to work on in between my machine piecing projects. I do do a little slow sewing specifically EPP. I have not attempted working with wool but could be persuaded to do so. I love slow stitching and hooking, so have a project nearby at all times, working on it most evenings. Almost every evening! Looking forward to these projects. I try to a least once a week to fill the need for fun! As often as I can squeeze it in and am mainly on my machine. But Maggie’s designs are amazing and that may change the amount of time dedicated to hand work!!! Thanks for the chance to win! Wowser! Not enough! I love all those veggies!! Would love to try this as it’s so portable! I hand stitch mainly on long car trips, I keep small projects in the glove compartment, and when flying–I keep a travel sewing kit in my carry-on. I try to squeeze in bit of time each evening for hand sewing. I’d love to try the projects shown here. I would love to sit and stitch those designs. Currently, most of my creative time is spent with the sewing machine. As often as I can – never enough! As often as I can, and usually in the evening. A comfy chair and good lighting a must plus a series or movie and I’m set! I absolutely love hand sewing, and I do it as often as I can! I’m discovering that applique is my favorite pass-time, and I love the primitive look of Maggie’s designs. Everyday–I try to always have a hand stitching project to work on in the evenings. Slow sewing is relaxing so I slow sew as often as I can squeeze it in. I often like to add french knots for texture to small art pieces. These are quick to do and add so much depth. As often as I can squeeze it in, would have to be my answer. Wool appliqué would sure cut down on some of the prep work. Most of my sewing is on the sewing machine, but I always have a slow stitch work in progress, or 2, or 3. The last option would be nice. I like to cozy into my chair in the evening and stitch away. As often as I can. I love wool appique. It is so peaceful and relaxing. I go in spurts–I do a lot of machine sewing and then I slow down and hand sew for a while. I do try to do some type of sewing every day. As often as I can, but at least once a week. I love to embroider (as well as machine sewing/quilting), and it’s so enjoyable. Thank you for the giveaway! As often as I can squeeze it in. Maggie has been a wonderful inspiration to me for working with wool. As often as I can squeeze it in. So relaxing. I enjoy the process of creating wit a needle and thread. I love knitting with wool and full or felt the wool. I am very interested ib learning more I can create with wool. I honestly just love her work! The older I get the more I am drawn to it! I usually try for once a week, at least, and I always have a take a long project for waiting somewhere. Most of my time is on the machine, but if I see something that draws me in, I go for it. As often as I can, which is not often enough. I recently taught a hand-sewing class to a group of elementary school girls and it reminded me of just how much I love slow sewing. Love wool. Have a kit to work on. I love hand-stitching and I usually only get to do it when I’m binding a quilt or hand-quilting, but I’ve been wanting to start doing something like this for a long time! I love the look of these projects!! They are so beautiful! And I’d love to begin working with wool, too. I do most things on the machine it I do like handwork for car trips and while watching tv…but I need to do it more often! I sew and stitch as much as I possibly can. I love the end products! As often as I can. I love slow sewing. it makes me feel great! I slow stich about 4 times a week for long periods. But I have to rest my fingers for a few days or I would do it every day! #4. I’d love to do more handwork. I mainly slow stitch when I’m on vacation. It helps me relax and reset. For me, it’s as often as I can squeeze it in!! At least once a week. I mostly slow stitch small projects that are for gifts. I might become a little selfish and make some gifts for myself. Ha Ha! Thanks for this giveaway. Love! Love! Love! I stitch when I can and I’d love to be stitching some Pure and Simple projects real soon! Three Winners! Woot! Woot! Super generous! I need to slow it down and do more slow stitching. I am able to do some when we go camping as I sit outside enjoying nature. Very relaxing. I try to do some every day. Sewing with wool is my favorite thing to do and I have soooo many projects!! I love to do this kind of sewing on a Sunday afternoon while listening to an audio book and some mindless TV. As much as I can fit in my schedule. Wish it was more. As often as I can. Love to work on it in the evenings while sitting with my husband. At least once a week, but try for at least 4 times a week. Every day after dinner and before bed. It is my time to wind down. I try to sew whenever I can! Most of the time it’s almost every day. Thanks so much for a chance, I love her work! I usually do machine sewing but this looks so appealing! I have not set time aside for slow sewing since I lost my best friend and quilting/wool buddy in Oct. of 2016. I keep saying it is time; yet have not done it. She would not be impressed because she used every free minute she had to either applique or quilt. I’ve only made one block of a sampler quilt in the slow stitch method. It was a little EPP 12 inch star. I would like to start on some wool stitching and winning a kit would be a perfect way to start. I’m with Maggie, I would like a superpower of being able to sew all the imaginary quilts in my head (and stash). As often as possible! I always have a hand stitching project or two that I can work on either in the car or while "watching" tv in the evenings. As often as I can! Not as often as I would like though. Most of my time is spent speed sewing. But I love, in the evening to do bindings etc. So I guess that counts as slow sewing. I really love applique, wool or cotton, but don’t set much time aside for it. I usually do machine sewing, but this book makes hand sewing look very tempting–I have done embroidery work on tea towels when I was in grade school and started some embroidered quilt blocks which I would like to get back too at some time. Speed sewing for me right now. I might have to try this slow sewing thing! Every day! It is truly my meditation! And I, too, love working with wool. I used to sew by hand all the time; looks like it’s time to bring it back into my life. Thanks for your generous gifts of sharing info and projects. I would say at least once a week. There are times when i have a real hand stitching marathon. I truly enjoy these times. I love working with wool. Recently none. It is not what I want and I am trying to get back. As often as I can. So relaxing to enjoy the process! At least once a week!! As often as I can, usually in the evening while watching tv or in the car on trips. I try to get some slow sewing at least once a week. I haven’t sewn with wool fabric but I’m going to give it a try. As often as I can, a lot gets done waiting at appointments! Usually do speed sewing. However after looking at the great projects, I realize how much I miss slow sewing. Love her primitive style. Most of my time is spent speed sewing. But her book has reminded me of how much I miss slow sewing. Love her primitive style. I speed sew. Hand work cramps my hands, so it is not fun to hand sew. Most of my sewing is fast on the machine, but I spend time hand stitching projects in the evenings at least three times a week I stitch and my husband reads aloud to me. We have enjoyed many good books together. I love to balance my machine quilting by having an embroidery project to do in the evening. Currently, i have two projects on the way which also include applique. Just loving the bag with the bird!!! As often as I can, I really want to try working with wool! In between my large quilting projects I need a break, that’s when I get down to "relaxing". Mostly machine sewing, but a couple weeks ago I sewed my first wool applique projects, bookmarks! I try to do some slow sewing at least once a week. It is my favorite type of sewing. This book looks fabulous! Thanks for a chance to win. I’m in love with the idea of slowing down. I mostly machine quilt and occasionally work on crewel kits from the thrift store, but I love the primitive wool look. What a great gift idea for my Mom! I have several projects started…keep them in a basket in the living room so I can see them….that way whether its too hot or too cold outside I can do some hand work when the inspiration strikes!!! I do mostly speed sewing on the machine. But I do enjoy slow sewing and I love anything primitive. I like to have some hand sewing to do while watching TV. The wool stitching has been on my list of things to try. I just haven’t accumulated all of the products for a project. I have two projects started but don’t seem to make time as much as I would like. Very cute projects! As often as possible! I do like my machine, but in front of the TV handwork is the best. As often as I can. These primitive projects are a whimsical delight. Each one brings a smile to my face. Very clever designs. I sew about six days a week. Slow sewing helps my fingers stay nimble, as I have arthritis. I find it satisfying and calming. I appreciated Maggie’s words about not worrying about perfection, and I try just to find joy in the work! 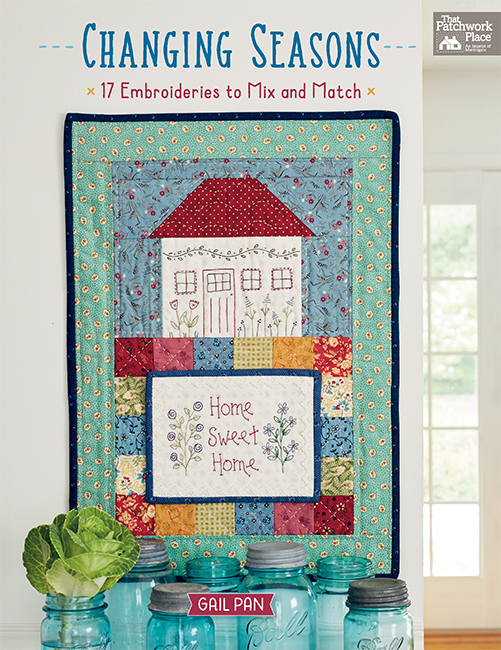 I look forward to hand sewing projects from her wonderful new book! Dana Bolyard – Old Red Barn Co.
Vanessa Christenson – V and Co.